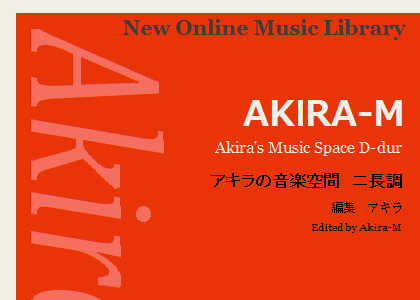 In "Akira's Music Space (Akira No Ongaku Kukan, in Japanese)", you can listen classical music for piano played by computer and download MP3 files at no cost. The original site is written by Japanese, and this site is translated by Akira-M (the webmaster of "Akira No Ongaku Kukan"). The original site has more than 600 MP3 files. I will add songs to this site as same as original site. Oct. 3, 2011 Add 100 songs. Sep. 22, 2011 Add 40 songs. Sep. 18, 2011 Add 20 songs. Raindrop Prelude, Fantaisie-Impromptu, and so on. Sep. 15, 2011 Add 10 songs. Ombra mai fu, Csikos Post, and so on. Sep. 14, 2011 Add 19 songs. Turkish March, A Maiden's Prayer, and so on. Sep. 12, 2011 Release this site. Add 1 song.